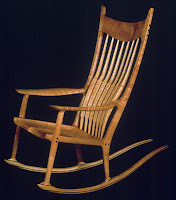 The world has lost one of its most well-known and iconic woodworkers. Sam Maloof died Thursday night, May 21, at the age of 93. You can read more about it here. Sam was a key element in the California modern arts movement and is perhaps best known for his distinctive rockers. The organic, clean lines and natural finish give his rockers life. About them he said, "All the parts come together in a very rational way, but they meet each other in such joyful connection. There seems to be a pleasure that the leg fits the chair. They're happy to be together. It's as if they really have grown together." I watched a PBS documentary last year called "Craft in America" in which Sam was one of the artists who was interviewed. His principle of following your heart, doing what you are called to do, resonated with me. Consider yourself fortunate if you were able to take a class with him or meet him in person. Like each piece of his handmade furniture, he was one of a kind. *The photo above is from Fine Woodworking's website.